Summary: You may be tempted to try do-it-yourself estate planning, but as Siedentopf Law explains, the risks associated with DIY forms can outweigh the benefits. There are a number of reasons why it is better to hire an attorney than to tackle the legal work yourself. There are several options for do-it-yourself estate planning on the Internet, in books, and other resources. While the documents can be drawn up and executed without an attorney, the risks associated with these DIY forms might outweigh the benefits. When it comes to estate planning, there are a number of reasons why it is better to hire an attorney than trying to tackle the legal work yourself. Nuances and Complexities: The more complicated your assets and family structure are, the more it makes sense to hire an estate planning attorney. There are a number of issues to consider when planning your estate: spouses or children from previous marriages, business succession, real estate, out-of-state property, minor heirs, disabled heirs, retirement accounts, charitable giving, tax concerns, etc. Whereas an estate planning form might not even address any of these potential complications, an estate planning attorney can help you navigate the legal process and draft an estate plan that works best for you and your beneficiaries. Specific State Laws: Every state has different sets of laws governing the estate planning process. These laws can affect things like what can/cannot be included in a will or trust, who you can appoint as your healthcare or financial power of attorney, who can serve as your executor, what happens to your assets if no will is in place, and many other formalities. An estate planning attorney understands the laws in your state and how to correctly apply them to your specific situation. The attorney is also up-to-date on any changes in the law, whereas online or printed forms might be outdated and possibly invalid. Which Estate Planning Tools Work Best For You: Just as there are different family structures and situations, there also exists a spectrum of different estate planning options. An attorney can meet with you, discuss your finances and goals, and then design an estate plan that best protects your family. Do-it-yourself forms do not provide this kind of guidance; people might unknowingly draft a Last Will and Testament when a Trust would have better suited their needs. If someone does not draft their estate planning documents correctly – if they unknowingly miss a component or a signature – it can change the entire intent of the document, or worse, render it invalid. Hiring an attorney at the start of your estate planning process can help avoid expensive mistakes and legal disputes in the future. It can also provide peace of mind knowing that your estate plan is correctly drafted, the documents reflect your wishes, and that your friends and loved ones are protected. 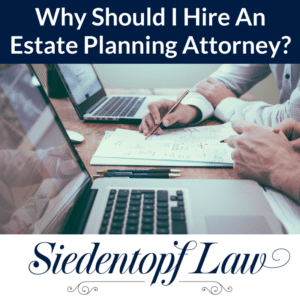 If you are interested in creating an estate plan, contact Siedentopf Law via our website at EstateLawAtlanta.com or by calling (404) 736 – 6066. To listen to Sarah discuss her top reasons for estate planning, you can watch her video HERE.